click the image above to visit the Mr. Helsinki web page. Though there were few painters of and on the Door peninsula around the time I moved here in 1969 (landscape artist Gerhard Miller of Sturgeon Bay, the most prominent and serious artist at the time), others slowly began settling in through the 1970’s, making it their home, and their subject matter as well: Charles Peterson, Phil Austin, Jack Anderson, Austin Fraser, Flora Langlois, Tom Segard, Bridgette Kozma, Milly Armato, Al Quinlan, Madeline Tourtelot and Jim Ingwersen among them. 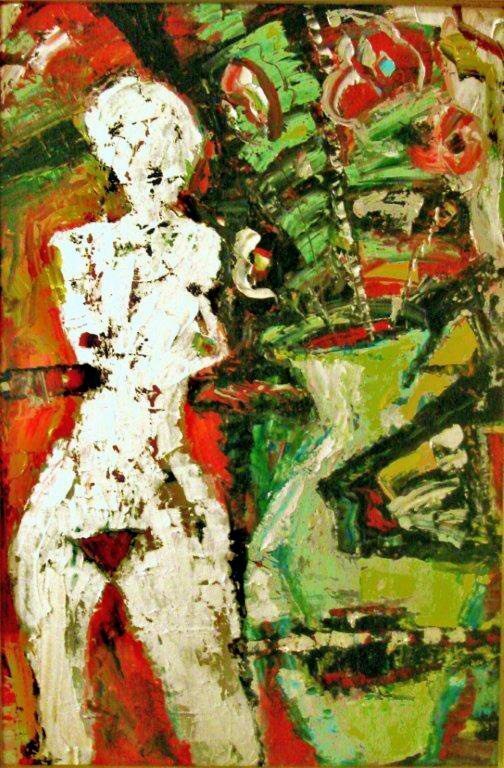 For some, Door County was not so much their subject as the right place to be, to work, to exhibit their paintings in their own studios, in local galleries, to grow in this setting. Anyone living here with an interest in art, knew almost all these people, recognized them in the community, were familiar with their art. 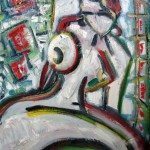 Since the late 80’s to the present, it’s almost impossible to keep up with the number of artists living, painting, exhibiting their work here, let alone grasp the wide range of their styles or subject, from traditional to abstract and beyond. 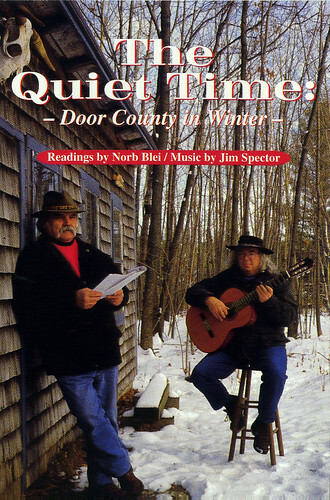 While the Door County Advocate did its best in years past to feature many of our painters, what passes for local attention today, often leaves much to be desired. I have always felt a particular empathy for younger artists here and what they’re up against in light of the history of successful, traditional painters, especially newer artists who do not paint the county, so to speak. How difficult it must be to attract any attention whatsoever, to find a gallery, a business, someone who will give them some wall space, a little publicity. Door County’s coffee shops seem the most open to this, especially Base Camp…Sister Bay; Leroys…Ephraim; and The Brew; Ellison Bay. I’m sure there are others. Danny Peterson’s Viking restaurant in Ellison Bay for one. 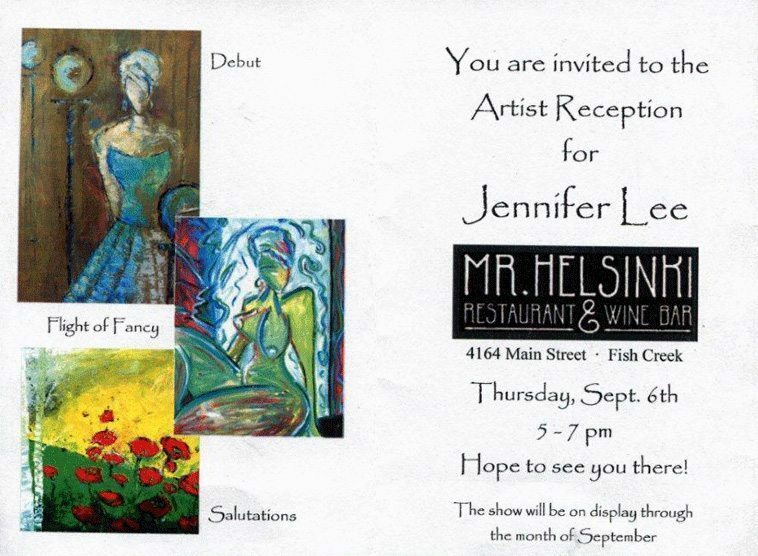 And certainly Mr. Helsinki, Restaurant and Wine Bar in Fish Creek, which has been very supportive through the years, and where you are invited to catch the work of Jennifer Lee, from September 6th through the month of September. Those who frequent The Brew in Ellison Bay may recognize the artist as the dedicated manager (barista-in-residence) who never fails to brew you a great cup of coffee with a smile. As far as Jennifer’s feelings regarding the present scene: “It seems like the greatest challenge for a younger artist in Door Co.–or anywhere I imagine–is being enthusiastic about your work. Many artists find themselves coming out of a school where their work has been graded, critiqued and/or judged over and over. I feel that the most important opinion about your work is your own. 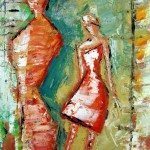 I developed a passion for painting in my early 20’s and never had any formal training. I didn’t have any rules to either follow or break and that has helped me stay excited about what I do. I think I sold a great deal of my early work through sheer enthusiasm perhaps rather than great art. “I often meet people who wistfully wish they could move to Door County. I tell them that while it may not be easy to make a living, it is worth it for the quality of life. In addition to being an artist I manage a successful coffee shop where I have fun and meet great people. I have met a number of ‘full-time’ artists that struggle to keep painting what “sells.” I enjoy the freedom to paint what I like and what sells….sometimes even both! At some time in the future I might consider taking up the brush full time, but in the meantime I’m sticking with the brush and the latte. Ha! She describes her personal approach to art as messy “…maybe a better word is spontaneous…I rarely sketch or plan my pieces. I like to lay the paint on the canvas with brushes, knives and fingers. Almost all of my work has several paintings underneath. I’ll live with something for a while, and then flip it upside down and try something else. The process gives the work a richness and sense of history. 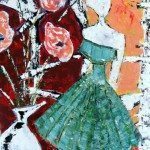 One of Door County’s most celebrated painters today is Franne Dickinson who happens to be Jennifer’s grandmother. What role, one wonders, does an artistic grandmother play in a young artist’s life? “Franne–or Molly as I call her–has been instrumental in cultivating my love for art. As a child she would take me to museums and galleries around the country; her passion helped me understand much of the art I was seeing. She and I went to Paris when I was 21 where I could barely keep up with her as we took in the city. 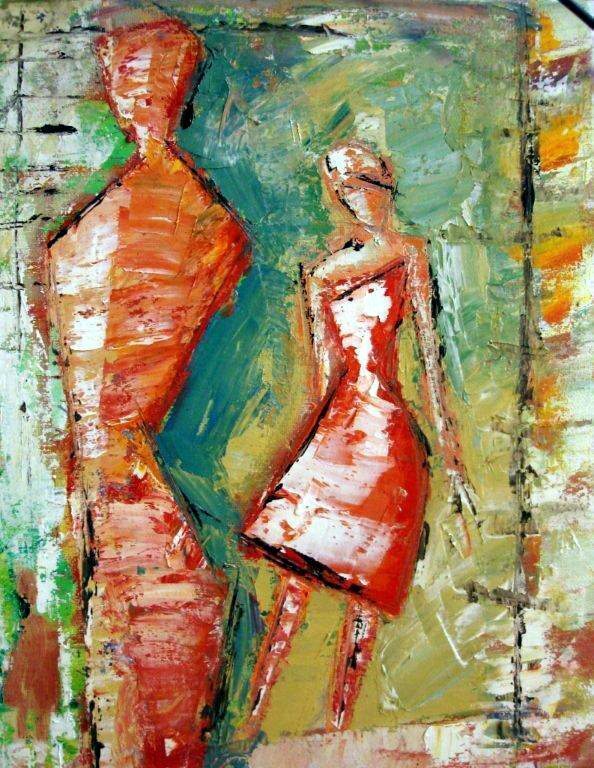 When I started painting she insisted that I trust my instincts and always encouraged me in anything I was working on. She introduced me to many wonderful and supportive artists and mentors who have helped me stay enthused about the work. “When I started painting Molly would host shows for me in her kitchen which was a great experience as I got a chance to talk about the work with others and got a feel for how people responded to it. A while later I was chosen as an “Emerging Artist” for the program with the Peninsula School of Art. That was a wonderful opportunity as it created a lot of recognition in the community as well as support. 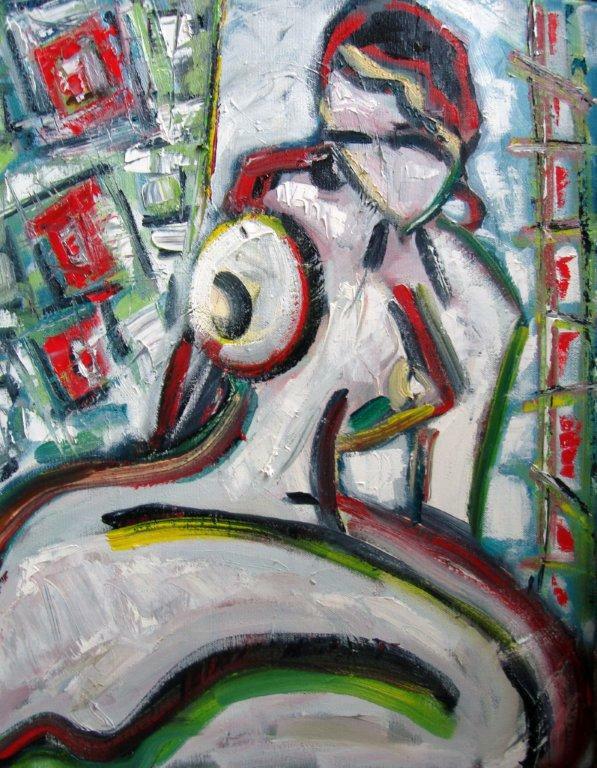 Also, Charlene Berg of Gallery Ten was a great champion of mine and I had a lot of success at shows in her gallery. My first exhibit at Mr. Helsinki was four years ago and was a great success. I sold almost every painting and people really enjoyed it. The space is perfect and I think there is something to be said for having a ‘captive audience’ amid your artwork during the course of a meal. Jennifer Lee moved to Door County in 2003 to pursue an art career after she unexpectedly found her passion for painting. Jennifer’s grandmother, Door County artist Franne Dickinson, jokes that she could hardly get Jennifer to hold a crayon when she was a child because she always had her nose in a book. It was a surprise to both of them when Jennifer found her intrinsic talent. 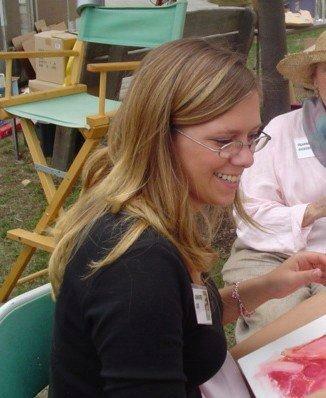 She is primarily self-taught with the help of friends, family and great mentors through Peninsula School of Art. 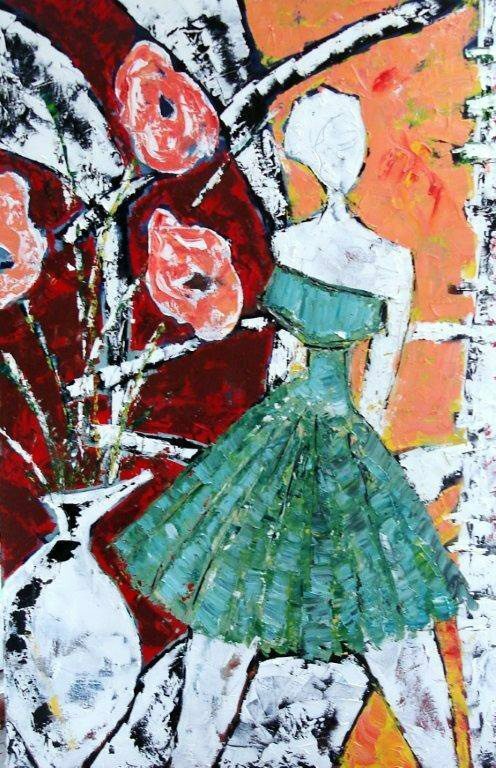 She paints on her surfaces without sketches or an intended outcome-letting the paint have its say first. She often uses unconventional tools and techniques through trial and error to create her unique compositions. In addition to painting, Jennifer manages a popular coffee shop, serves as a volunteer board member for the Wellness Center of Door County, and still has her nose in several books. Jennifer’s work is available at Brew Coffeehouse in downtown Ellison Bay and The Toe Path Studio on Anderson Lane in Ephraim. She currently is painting a body of work for a show at Mr. Helsinki Restaurant and Wine Bar in Fish Creek which will be on display in September. I am someone who looks for paintings of the county…thanks for expanding my vision.